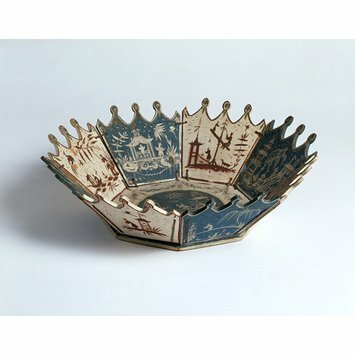 This bowl, held together loosely by cords, was almost certainly designed as a 'Quadrille pool' or a container for ivory or mother-of-pearl gaming counters. Quadrille became a fashionable card game in the 1720s and remained popular throughout Europe until the early 19th century. It was particularly favoured by women. Players might have their own boxes of gaming counters, often in sets of four. The four players might stake large numbers of counters during a game and such 'pools' kept them orderly on the card table. The fine painting on this one is still in very good condition, except on the inside of the base, where it will have been damaged by the sharp edges of the counters. The painting includes delicate scenes in Chinoiserie style, including exotic trees and imagined Chinese figures. Marked in ink on base. Elizabeth Miller and Hilary Young, eds., The Arts of Living. Europe 1600-1815. V&A Publishing, 2015. ISBN: 978 1 85177 807 2, illustrated p. 171. Quadrille was played in groups of four people and particularly favoured by women. It became a fashionable card game in the 1720s and remained popular throughout Europe until the early 19th century. 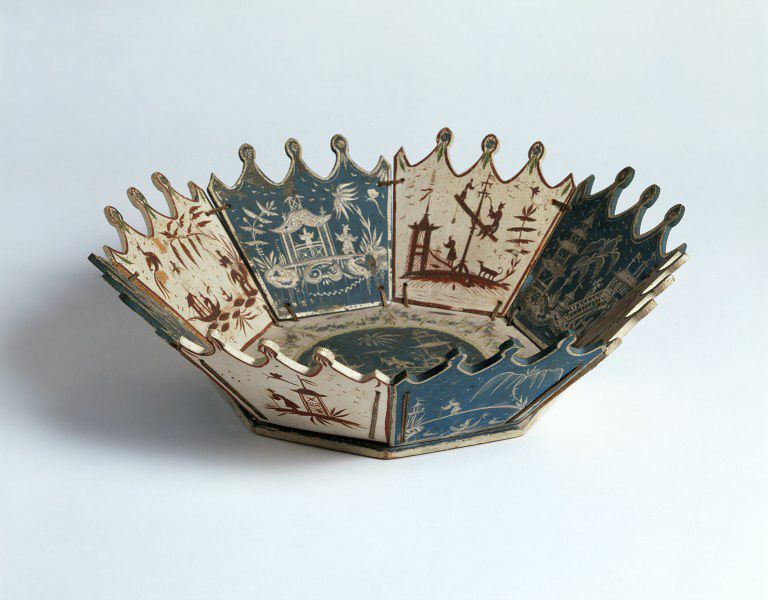 This bowl was intended to hold ivory or mother-of-pearl gaming counters during a game of quadrille. It is decorated with delicate chinoiserie motifs.